The left wing pressure group 38 Degrees are trying to raise funds to run an outdoor advertising campaign about the NHS. 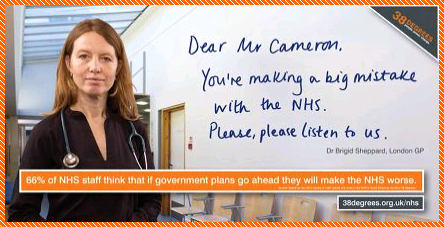 The ambition of the ads is to raise public awareness of the reforms and convince David Cameron that the NHS will be an election issue if he doesn’t rethink his plans. They’ve so far raised over £80, 000 of their £100, 000 target and it seems likely that the ads will run. Just over 6000 different individuals have donated, which is not an insignificant number of advocates. The posters are ‘hard working’ (adspeak for unambitious and requiring minimal effort from the observer), but they will do a job for those already interested in the campaign. However, the hope for the posters, as stated by 38 degrees, is to scare the uninformed into taking an interest in the reforms. I’m not sure this slightly bland creative will achieve that. (Thanks to Sarah Sternberg for sending). Previous Is “Rombo’s” mudslinging starting to backfire?